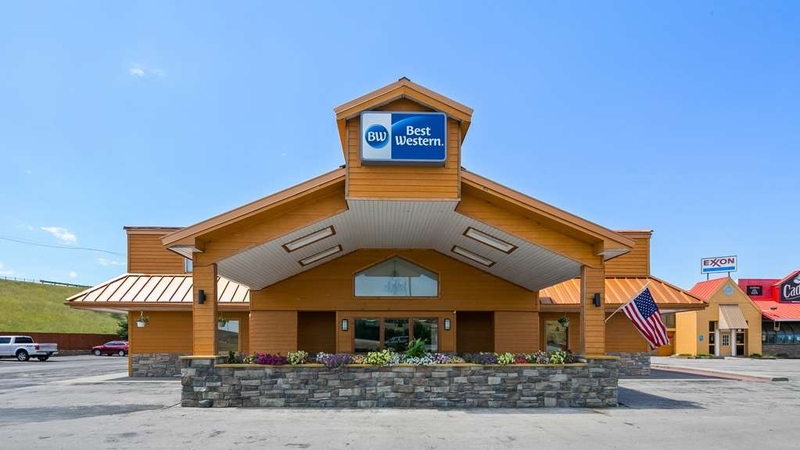 El Best Western Sturgis Inn se encuentra en el centro de Sturgis. Venga y disfrute de las mejores atracciónes turísticas cerca de nuestro hotel. Precios bajos garantizados y ofertas exclusivas. Situado junto a la carretera interestatal 90, este hotel proporciona una estratégica ubicación para su viaje al Monte Rushmore, el monumento a Crazy Horse, Devils Tower y otros muchos parques nacionales. Con una céntrica ubicación junto a las principales atracciones y parques nacionales, este hotel BEST WESTERN de Dakota del Sur proporciona unas cómodas y asequibles habitaciones que lo convierten en el lugar de alojamiento idóneo. Los huéspedes del BEST WESTERN Sturgis Inn podrán apreciar impresionante grandiosidad del Monte Rushmore, el Parque Estatal Bear Butte the Black Hills. Durante su estancia en este hotel de Sturgis, Dakota del Sur, no tendrá tiempo de aburrirse gracias a la magnífica variedad de atracciones locales. Disfrute de una terapia de compras en el centro comercial Rushmore Mall o tome parte en las actividades de recreo del centro municipal Sturgis, Wooded Field Park y Lions Park. 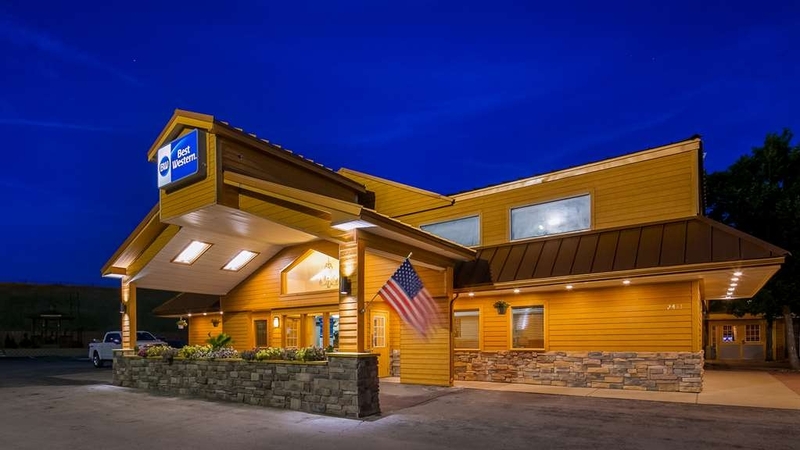 El BEST WESTERN Sturgis Inn es el lugar de alojamiento idóneo para participar en el Rally de motocicletas de Sturgis. No olvide visitar el cercano Salón de la Fama del Motociclismo. Muchos de nuestros visitantes escogen este hotel BEST WESTERN de Dakota del Sur, como por ejemplo el Mustang Rally. Los huéspedes en viaje de negocios gozarán de un fácil acceso al Hospital de Veteranos Ft. Meade y la base aérea de Ellsworth. 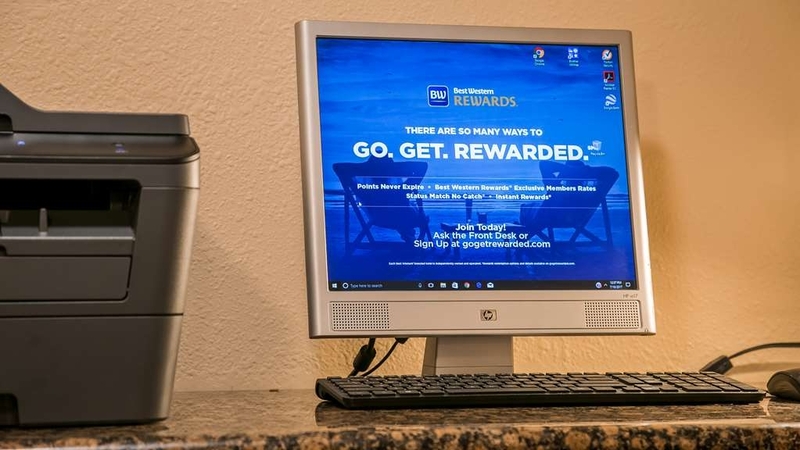 Las acogedoras e impolutas habitaciones del BEST WESTERN Sturgis Inn cuentan con acceso gratuito a Internet de alta velocidad inalámbrico, televisión por cable vía satélite, cafetera, escritorio y mucho más. Durante su estancia en este hotel de Sturgis, los huéspedes también podrán disfrutar de una piscina cubierta de gran tamaño, bañera de hidromasaje, sala de juegos y estacionamiento gratuito. Comience el día de la mejor forma con un desayuno continental gratuito servido cada mañanaSi desea disfrutar de una magnífica estancia en este hotel de Sturgis, Dakota del Sur, con un magnífico servicio de atención al cliente, realice su reserva en línea en el BEST WESTERN Sturgis Inn. Stayed March 24, 2019. Attending a funeral for mother-in-law in nearby town, I booked 2 rooms, and others in our family took my lead and booked at least 5 more rooms, some stayed 2 nights. Our whole group of relatives were very happy with the rooms delighted with some upgrades, the kids enjoyed the pool, grownups liked the hot tub, even though it was cold outside.Breakfast room was clean and hosted a nice fare. I, personally liked the waffle iron that made 4 mini waffles. "Price gouged for a crappy room"
The receptionist couldn't grasp the concept of a client paying with cash. He was unable to provide me a receipt for my negotiated cash deposit of $40. When I suggested he write out a simple receipt on a sheet of paper, he said “don't worry about it” and handed my deposit back. The room was old and worn and smelled bad. We were forced to rent a room because of a blizzard and the interstate being closed and I feel there was some price gouging going on. I've stayed at several different Best Western hotels in different states this year...about 37 times this year and never been charged more than I was for this one. I'm was beginning to wonder if this was even a legit Best Western because their standards were so low compared to what I am accustomed. When we arrived in Rapid City I booked a hotel at one of your competitors. A hotel 3 times as nice, with a much nicer staff for a third of the price. I have been a very loyal customer and spent several thousand dollars on stays at Best Western, but I am unlikely to stay again in this part of the country. "Good place good price "
Stayed here the other night, got a great rate on the room, and for the price I would definitely stay there again. Staff was super friendly and rooms were clean. Pool and hot tub were good and the wifi worked great.. great and easy experience with the best western. Our family gathered here because a central location. It was the perfect place. The pool was great for the kids and was fenced, so the area around it was safe for little people if parents didn't want them in the pool. The area around the pool was spacious for us to hang out and play games. The rooms were small, but we weren't in them much. They did have a refrigerator and microwave. "Great room, nice pool and awesome breakfast!" My son and I stayed here for a quick ski weekend. The room was very clean and comfortable. The shower had great pressure and temperature. The pool was large and well-maintained. Lots of channels on the TV (some were scrambled, which I felt they could have deleted so you could skip them). The hot tub felt great (and is quite large). The free hot breakfast was delicious and had a surprisingly large number of options (scrambled eggs, sausage links and patties, biscuits and gravy, cereal, yogurt, toast, muffins, waffle irons and mix, hard-boiled eggs, fresh fruit, oatmeal with granola, juice, coffee, and tea). The only thing that could be a downside for some (which wasn't for us) was that it sounded like the room next door had their bathroom fan running the whole time. An exceptional deal for the price we paid. Thank you so much for the great comments Jeremy! I am a Park Ranger at Yellowstone who has to travel home to Pennsylvania twice a year.I go out my way to stay at the Sturgis Best Western.I will drive a short day just to spend the night there.The rooms are always clean.The breakfast is awesome,The owner and staff are very courteous and helpful.They have a great Jacuzzi. I spend a lot of nights in hotels over the years for work all over Wyoming,Montana and Idaho. Hands down the Sturgis Best Western is my favorite hotel across the entire U.S. I would highly recommend staying there if you have the chance. When I am there it feels like home. "Don't get a pool side room during Thanksgiving." Don't get pool side room during Thanksgiving. They have a big sign saying that no glass or food and yet there were people having a big Thanksgiving dinner in the pool area. The room was hotter than the pool area and would not cool down. Thank you for sharing your invaluable feedback with us. We are sorry to hear that your experience was less than exceptional. We strive to exceed all expectations and pride ourselves on amazing guest service, and great room experience. Thank you for bringing your experience to our attention, and we hope you try us again next time your passing by. This place was very clean. We went when it wasn't Sturgis, so it was quiet and relaxing. There are a lot of rooms, they have a great Breakfast and the pool was very large. Friendly staff and the location is a great place when you first get into town. Restaurants and gas stations near by. Thank you so much Kimberly for staying with us at Best Western Sturgis Inn, We are very happy you had a quiet and relaxing stay with us. We are also happy you enjoyed our great breakfast which include, Waffles, Scrambled Eggs, and Sausage. See you next time you are passing by. Thank you so much for the great comments, it is great to hear you had a great experience with us. We hope to see you again very soon. Sturgis Best Western Inn Sturgis was clean. The staff was courteous and helpful. My room was clean. I would recommend The Best Western Inn Sturgis to anyone who is going to be in the area for one night or one week..
Gary it was great having you stay with us again, thanks for the great comments. See you next time. "This property is aging but comfortable." We made a 2 week trip into South Dakota and the Best Western in Sturgis was a 2 night stay during that trip. We stay at Best Westerns as often as we can and consider them to be reliable, comfortable and reasonably priced hotel. This was all of that but in real need of some work. The carpets on the stairs leading to the pool, hot tub, and breakfast area are very dirty. Replacing them would be a very good idea. Our room smelled very strongly of cleaning products. Wonder what needed that over cleaning. I think the best part of the stay, had nothing to do with the hotel chain but with some guests we talked with. They were from the Netherlands and so much fun to talk to and learn about their adventures in our country. "Stayed there for Cannonball Run"
I can not recommend this hotel. I called ahead to request early check in for around 2:30. We arrived at 2;45 and were told it would be a short wait. We had a 4:00 appointment and left at 3;30...still waiting for our room. We arrived back at 5:15. Our room was finally ready at 6:15. We had reserved their suite which was just a bit larger room. The bed was very hard and the room was marginally cleaned. I would never stay there again!! Hotel was close to dining, fuel, and entertainment! However, it did not have a bar/restaurant, once I check in I like to NOT have to drive anywhere. The room was big enough for three men, two big beds and a pull out, very comfortable. The clerk (whose name I've forgotten) was very polite and informative. Thank you so much for the great comments, Our staff is very happy you had a great stay with us. See you next time. "Worn out but better than nothing"
Hotel needs renovated. It's worn out and needs updated. Room smelled funny. They are motorcycle friendly. There is a closed down restaurant on site. Next door to a gas station where you can pick up some beer and snacks. Inside rooms in summer are very hot because of the hot tub and pool, the air conditioners are noisy when running and constant on and off. 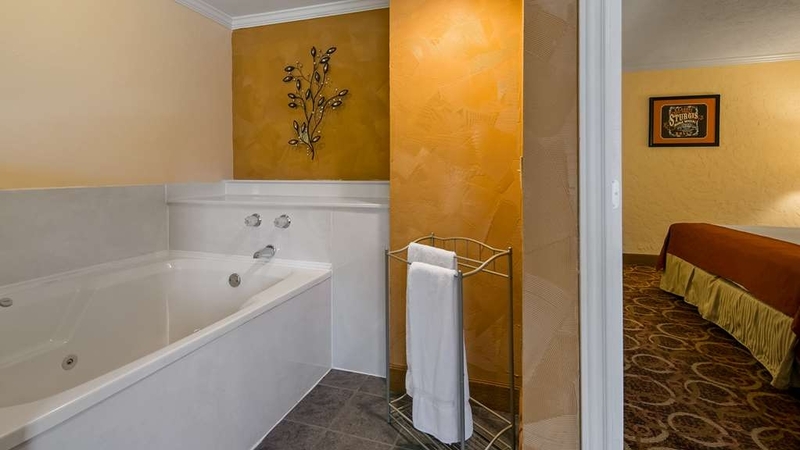 Old style bathtub with toilet adjacent( bathroom is 5'x 5' approx if you are big you would have to back in to use the toilet, Breakfast is porable scrambled eggs,some form of precooked sausage the usual waffle machine,limited seating,hot tub didn't look clean. The only reason I give 2 stars is because I was grateful for a room this busy Friday and Saturday night (I had a reservation at holiday inn express that changed names back in June). They leave you a note on the bed when you check in asking that you rate them better than 8 on the online survey since 8 is only average. Laughable since this hotel wasn't even average especially for just under $150 a night. This is a run down old hotel. Furniture is dated and seen better days. Old uncomfortable matresses with the litte square pillows. The bathroom was tiny with a nasty tub with black (maybe mold) around the caulking and dingy grey non slip coating, walls and floor dirty in the corners. The pool looked too dirty to swim in. Breakfast was disorganized - running out of waffles and coffee. Wasn't a big enough breakfast room. When we got back to our room Saturday night room was cleaned but they only made 1 of the 2 beds. Upon checkout wasn't asked how my stay was. I visit black hills every year. Hotels are nice in this area. Usually Best western's are nice. No idea how this hotel gets 4 stars. This is the worst Best Western and should be shut down. For the money paid my room shouldn't have had town curtains and the fly's coming out of the sink at least 50 a day killed in the room. No vacuuming was done as the dead fly's were still there daily. Omelets should have been cooked for the price. Lets talk about the trash in the pool and that is lightly mentioned. Thank you for your review, I would like to apologize again for the problems you experienced during your stay with us. We value your business upon hearing of your problems at check out you were given a refund of $200 and offered a free night for your future stay. I hope you give us another try and we will make sure you have a great stay with us. Thank you so much for the great comments, It was great talking to you, see you next time. 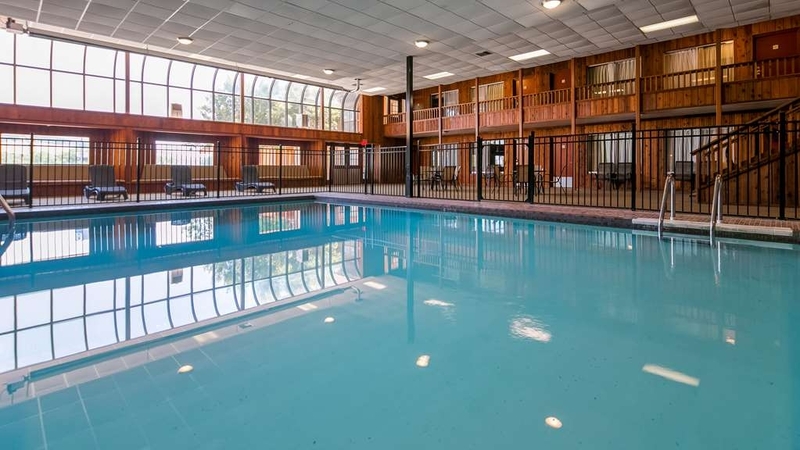 A comfortable older facility, showing it's age, good parking, good water quality, nice pool and hot tub, very average breakfast, bed and pillow quality was good and house keeping did a good job, but were around very early in the morning, ask for a pool side room, would be quieter. "Great value. Great hotel staff." Mr. Khan and his staff were great. Overall the rooms, pool and breakfast area was clean and well maintained. We loved the personal note at check-in. My only suggestion would be to clean up the old restaurant and lease it out or have it torn down. This is an older property but it has been well maintained for its age. The staff was very responsive to our special requests, and we did have a few. The room was priced right, and we were able to get a discount for being members of the Best Western loyalty program. Room was very clean and there was a personal note from the cleaning staff. Very pleasant staff overall. Fast Wi-Fi which my kids loved. Plentiful ice. Nice swimming pool and hot tub. The air conditioner in our room worked great, but it was loud. That's actually okay because it covered the highway noise since our room was the closest one to the interstate. The breakfast was a typical hotel breakfast with waffles, scrambled eggs, either biscuits and gravy or sausage on an alternating basis, a few cereals, oatmeal, and cheap little muffins and donuts. But many for a diabetic, but my kids loved it. Too wet to camp. Prices here were reasonable, but then it's before the rally. The room was clean. Close to Taco Johns (across the street). The pool and hot tub looked amazingly inviting, but I had my dogs with me. Thank you so much for the great comments! Hope to see you again very soon. I can only comment on our room, as we didn't use the pool area or breakfast. We were impressed with how clean our room was and the comfy beds. We met Dixie, our housekeeper and she was so fun to visit with and made sure we were happy with our room. Our stay at the Best Western in Sturgis South Dakota was ok. The hotel itself is in much need of updating. That being said the staff and the cleanliness of the hotel was fine. Take sine of that Sturgis Rally money and do some updating. Thank you so much for your comments, We are very happy you enjoyed your stay. Hope to see you again when you are passing by. Thank you Bernie for the great comments, I am very happy you and your family enjoyed you stay with us. See you next year! We stayed in their King Jacuzzi room on New Year's Eve. Two large rooms. The main room had a Jacuzzi, microwave, refrigerator, desk, TV and leather couch. The second room had a King size bed, TV and large closet. Bathroom with shower and tub. Very clean and new carpeting. Had a thermostat to regulate heat. We didn't eat breakfast this time but have before. Great breakast and staff. Kathy thank you for the great comments, We are very happy you enjoyed your room and your stay. See you in the summer. Great place to stay on my frequent trips between Montana and Nebraska. nice rooms, friendly staff, and pet friendly. i stayed for the first time in september when i was driving through and have stayed three additional nights since. Thank you for the great comments William! see you next time. "Great Staff, Helpful advice about restaurants and Motorcycle Museum"
Couldn't of had a better experience with happy employees eager to give local advice about restaurants and things to see. I enjoyed the staff and they welcomed me and my dog. Fun place to stay and clean accomadations. Thank you so much Douglas! see you next time. Easy access off of I-90. This is an older hotel, but it is in good condition and clean. You can hear people open and close their doors which is common in older hotels. The people who work there are very friendly and accommodating. Great breakfast selection with an attendant that made the whole experience entertaining and enjoyable. Debra thank you for staying with us and for the great comments about our staff. We hope to see you again very soon. "1880 Train and Wine/Beer Tour"
These folks were great. There were four couples together and we showed up later in the evening, feeling pretty animated. They took great care of us, and were very friendly. The hotel is dated, but very clean, and reasonably priced- will definitely be back! So upon arrival to this hotel I was a bit concerned, being that the location is kind of dim, but when I checked in the front desk lady was very nice and helpful. Now, being that I am a young girl traveling alone with my dog I prefer to stay in hotels that you have to go through the lobby to get to the room, but this hotel had rooms in and outside. I was put in more of the motel style part (I'm assuming because I have the dog). It was still very nice though and they had a dog walking area right behind the room. I was still a bit nervous though going in and out with other people around up until I was sitting on the bed eating a pizza id picked up and the hotel phone rang. Also part of my nervousness being that it was Friday the 13th and they put me in room number 13 lol! I'm not very superstitious, but my heart did jump a little at the phone ringing; who the heck could be calling here?! it was the front desk lady calling to check on me!! I've stayed in plenty of hotels and have never had that happen! It put my mind at ease to know someone was there if I needed anything and completely made my visit. I wish I knew the employees name, but I didn't pay attention. Either way thank you so much! this place has such a wonderful staff!! The room was very clean and tidy, but obviously old. Bed and TV were quite nice. Better to use your own soap, shampoo, etc altho the bathroom was very clean. The staff were all excellent, very friendly and accommodating. The breakfast was revolting, even with my iron stomach, so plan on going somewhere else to eat in the morning. These people are awesome & so kind. The Rooms were clean, and the decor is awesome. (we are a big Harley family), we want to thank you guys for letting us book on such a short notice & being awesome help! 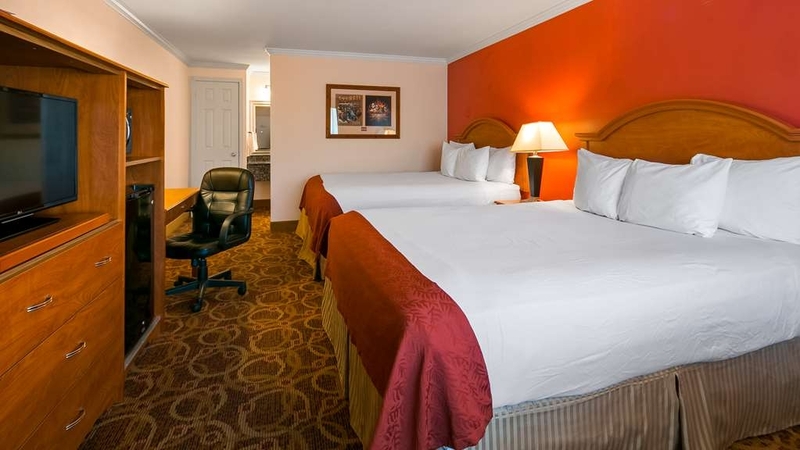 the room was well maintained no issues with the comfort or the amenities. I would stay at this location again. Since we stayed there 4 nights my only wish would be that they change up the menu just a little from day to day. Switch out the meat selection from just links to maybe patties or bacon. The value was good for our stay. One day they were cleaning the sidewalk and took extra care to block any dirt from entering the room, very thoughtful of them. I'd use them again. "Great surprise after an epic day of riding"
Best choice of the trip was to go to Sturgis the day AFTER bike week. Hotel rooms were regular price at $80. Ground floor room so we could park the bikes outside the door was perfect. Nice breakfast included. 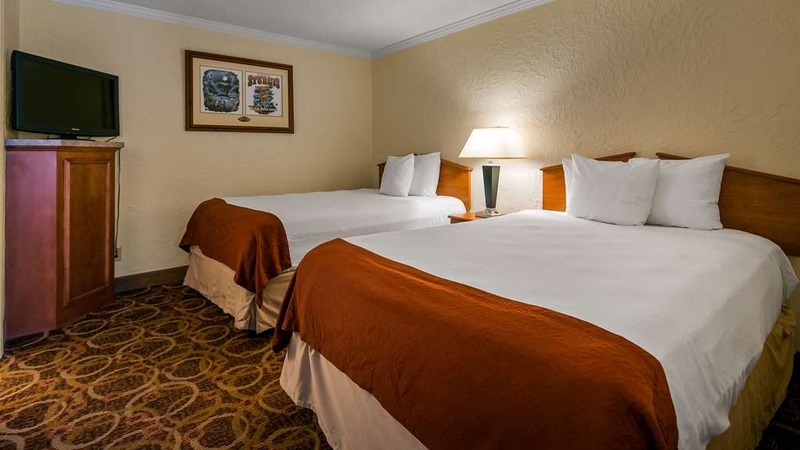 Great service, excellent room with a comfortable bed and super clean. Free breakfast was delicious with lots of variety and kept well stocked. Quiet even though it's right off the highway. Would definitely return. As any other BW stay - decent rooms, decent service - the location is as always also pretty convenient closely located to the highway but not so close that it disturbs your sleep. We enjoyed our stay here. Best part was the hot tube! The beds are worn out, soft isn't the right description. They either need to flip the end and put it to the top or move the box springs under it. The head of the bed slants down. Room was clean, for most part everything was clean. The stairs outside are worn but thats just visual appeal. You can see in the lobby they have been working on some updates. My issue with Sturgis in general is the price gouging during the August. We are here for work and prices are about normal for a hotel $95 to $110. During August it jumps to almost $300. Good thing i never plan to be here during that time. Dog pee on bed skirt! It smelled awful. The room should have had a much better cleaning. I will not go back to Best Western again without checking the room for cleanliness. Beware of the mess left behind by dogs. This was one of the best nights stay at any hotel. We really enjoyed the room. The beds were very comfortable. The breakfast was great. The staff were really nice and friendly. We couldn't have asked for anything better. Thank you so much Robert for the great comments!! See you next time. "Lovely stay at a friendly hotel"
I felt completely at home during my 3 day stay. Surrounded by ever cheerful and ever helpful staff. The location was nicely located near the entrance to the Vanocker Canyon Rd. A great place to start any treck heading North rather than taking the interstate highway. Easy to get to right off of the interstate. This is an older motel, so bathrooms are a little on the small side. They have painted and updated a little since our last visit two years ago. Rooms were clean and neat with decent beds and linens. Breakfast server was friendly and caring, wanted everyone to enjoy they're stay. That being said, the quality of free breakfast was just ok, nothing to brag about! Can definitely tell rooms have been updated since our last visit a few years ago. All staff here are personable and efficient. Room was clean & bed comfortable . Standard continental breakfast . Older property , bathrooms a little tight but not a big issue . If passing through again , would definitely stay here . I have mixed reviews about this hotel. It's definitely an older property, and they have tried to keep it up, but you can see it's age. The room we had was rather odd. It had a large front room with a couch, chair, desk, fridge and microwave. There was a good amount of unused floor space, which I suppose would be good if you had a rollaway crib or air mattress. The couch may have been a fold-out bed, I didn't check. My sense of smell is not good, but Debbie said the room smelled of old socks. There is a separate room with the bed(s) and bathroom, and it has a door for privacy. The biggest issue I had was that there is an HVAC unit in the front room, but no vents in the separate bedroom or bathroom. It was in the 90s and hot, so we had to go buy a fan to circulate the air from the front room into the bedroom and bathroom. The first night was a bit uncomfortable, but after that the room cooled down OK if we left the fan on constantly. The bathroom was a decent size. The back of the hotel, where our room was, backs up to I-90, but we were not disturbed by noise from the highway. The manager was a very congenial fellow, and was kind enough to provide a hose and bucket to wash cars, since we were in town for a car show. Everyone else on staff was also nice and friendly. The rooms have outside doors, which doesn't bother me, but some people are uncomfortable with that setup. We had some friends with us that stayed in a different room and they didn't complain of their room smelling bad. If the room had not smelled and the HVAC system was brought up to modern standards, I probably would have given a 4 or 5-star rating. As it is, it's not a bad place to stay, but will do if you want or need to stay in Sturgis. "Another great year with Khan!" Service here is better than any other hotel I've been to. Khan is the manager but more than that he is our friend and the breakfast man too, James. The people at this hotel are always willing to go the extra mile and that's important! 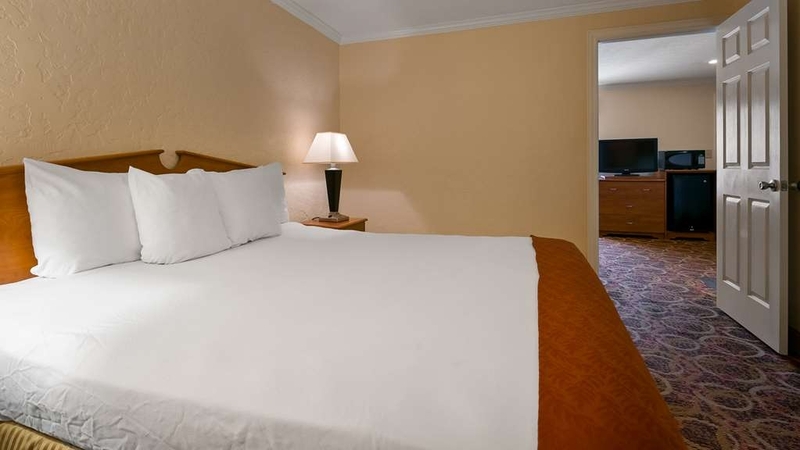 Also the newly renovated rooms are great all for a more than reasonable rate. I don't ever plan on staying elsewhere in Sturgis. See ya next year! You guys were great! Thanks for the review. See you next Mustang Rally. The hotel was easy to find and in a good location. However, the room was dingy. Although the mattress was old, it was comfortable. We were on the 2nd floor but there was no elevator. Breakfast was just o.k. Thank you Judy for your comments, I am very sorry you were not satisfied with your stay. I hope you give us another try and I will make sure you have a great stay with us. Overall room appearance pleasing noted worthy of Sturgis to have art work from previous Sturgis events . Bed was very comfortable had a wonderful night sleep after driving for 7 hours. Breakfast was very good nice to have scrambled eggs and sausage. Thank you so much for the great comments. We are very happy you had a great stay with us! Stayed one night last night of Sturgis (Sat) and was blown away by the helpfulness and friendliness of the staff. Pricing was even very good considering. Great hot tub and pool and safe parking for the bikes. Will stay again. Thank you so much for the great comments about our staff!! We are very happy you had a great stay with us. We hope to see you again next year. Very ran down way over priced our room smelled of ur in the bathtub was very dirty did not use it!! The room smells like smoke the pool area carpets are stained and dirty This used to be a great place to stay but has really got rundown . "Handicapped persons should seek out another hotel." We did a cross country to retrieve our daughter from school on the east coast, and decided to take I-90 from Boston across the upper US. Almost all of our hotel stay were at Best Westerns, which are not typically luxury hotels, but usually are clean and affordable. We decided to do some sight seeing around the Black Hills of South Dakota, so we booked in advance in Sturgis, SD. Since I am an amputee, we requested a "handicapped accessible" room. When we arrived, we were told that the only room available was an upstairs room. Now, this hotel doesn't have an elevator, and since I am confined to a wheelchair, this became a real issue. I managed to get up the stairs, only to find that the room wasn't even a handicapped fitted room. NO shower chairs, NO safety bars in the bathroom, AND to top it off, my wheelchair wouldn't even fit through the bathroom door. We complained to the front desk, but were told that was all they had available. We decided to "make due". I decided to check out the situation a little past 12:00 midnight, and found the parking lot only about 1/3 full. I again, checked around 6 am and found the same thing. NOT only that, but there appeared to be vacant rooms on the first floor. I again went to the front desk to talk with the hotel manager and was told that the night clerk had apparently made a mistake. Then she gave a lame excuse that some of the rooms were being repaired. Oh well, Miss Manager....I won't stay with you again! "Worst hotel I have ever stayed in dont stay here"
"Disgraceful !!! DO NOT STAY IN ROOM 17"
Tried phoning hotel to book , no answer so booked a KING room on AARP. Checked in, got to ROOM 17 - two small double beds, room door is in indoor pool area so room stunk so bad of chlorine my eyes began to itch and I got a headache. There was the added extra of screaming children in the pool, a video arcade machine close to the door, and and wet carpet outside the door. We went to reception about not getting the room we had booked and PAID for , got told hotel was full and there was nothing they could do - they blamed Expedia. We went out for the evening ,came back when we knew the pool would be closed, went to bed -then the major problem begun. The pool pump house is in the room next door and runs all night, it vibrated through our room and made a loud tortuous droning noise which sounded like there was a compressor in our room. At 1am we phoned reception unable to bear the noise and the overpowering chlorine smell - we were told they could not turn the pump off, we asked if there was anything they could do and were told no. We ended up packing up and leaving , turning up at 2am at another hotel close by and paying for another room. THIS ROOM SHOULD NEVER BE ALLOWED TO HAVE GUESTS IN IT. The next day we phoned to see what they were going to do and were told the manager was not in town so there was noone we could speak to. They advised us there was no stand in person in charge at all - this is unbelievable or a lie. What happens in emergency situations? We were told we had been checked out and would not be charged for the remaining night we had booked, after much debate we were then credited with the disaster night. THEY STILL BLAMED EXPEDIA AND TOOK NO RESPONSIBILITY. BEST WESTERN YOU HAVE BEEN LET DOWN BY THIS HOTEL. Thank you Mechelle for your comments, We are very sorry to hear you were not satisfied with your stay. I hope you give us another try and we will make sure you have a great stay with us. "Nice place to stay in Sturgis"
This is a nice spot to stay in Sturgis. It's close to the freeway for quick access to riding. The beds are comfortable and the king suite was really nice and a good size. A cab to the bar is only $8. So it's close enough to. We stayed at the Best Western for a family reunion in Sturgis, SD. The staff was very friendly and the beds were fairly comfortable and it was quiet both at night and early in the morning. Also, we enjoyed the complimentary breakfast, blueberry waffles were delicious. Thank you so much Mary for the great comments, We are very happy you had a great stay with us. We hope to see you again very soon. Husband and I stopped here on our drive home to Illinois from Montana. As it was just a place to sleep, we searched Priceline for a clean and comfortable hotel right off the interstate. We figured we couldn't go wrong with one of their 3 star express deals. The reality is, if this BW is a 3 star, I have grave concerns about the condition of anything 2 1/2 stars or less in Sturgis. The good: It IS right off the interstate highway. The bad: The nonsmoking room (I even initialed saying I would not smoke!) smelled strongly of smoke. Active railroad tracks right next door drowns out anything you're trying to listen to in room. The decor is circa 1983. The air conditioning was barely functioning. Room was warm and stuffy, even at lowest setting. Funky black hairs on ice bucket. I'm a redhead. We had to walk through indoor pool area to get to our room. The carpeting along the way was filthy and the pool area had an extremely strong smell of chlorine--almost chokingly strong. This is NOT a 3 star motel "along the lines of Hyatt or Doubletree" as per Priceline. No way, no how. I'm seriously skeptical of the glowing reviews this BW gets here on TripAdvisor, too. I can't recommend. If we hadn't prepaid, we would have kept driving. This hotel reminded me of places I would have stayed in my childhood. The guest room doors opened directly to the outside and the style of the hotel was something from the 70s. It worked fine for our one night while on a road trip. The convenience of being right off the freeway was great. The breakfast room was small and therefor the variety of things offered was smaller than I expected. I probably wouldn't make this my base for a longer stay but I wouldn't hesitate to stay while passing through. Check in and check out were very good. Only negative we noticed was that the room carpet and hallway carpets could have been cleaned better. Other than that, we were happy with the hotel staff that we came in contact with and the breakfast was quite good. Thank you so much for your comments, We are very happy you had a good stay with us. our maintenance has shampooed the carpets. Thank you again for letting us know and we hope to see you again very soon. carpet was so dirty that black water came off my feet. when i showered in the morning.breakfastwas satisfactory.getting to room was a bit of a problem do to access for older people.had some trouble finding the ice machine. Thank you so much for your comments, We are very sorry that your stay was not up to expectations, I have notified the maintenance and housekeeping about the issue you had. Thank you again and we hope you give us another try. First we were given a dirty room, the reservation was supposed to be a queen room but was given 2 full beds. The room had no shower curtain and no coffee. The entrance had a lot of pot holes. I would not recommend this motel! "Excellent service and fantastic accomodations!" A great place to stay in the Black Hills. My mother and I pulled in late to this hotel. The staff was so kind and helpful. We got to our room and it was spacious, clean and decorated in the lodge style. We were traveling with my little dog and the room was perfect for him as well. Beds were comfortable and the room was quiet for a good nights sleep! We will be back. Thank you so much Jennifer for the great comments, We are very happy you had a great stay with us. We hope to see you again very soon. "Poor hotel, very nice staff, avoid if possible"
I am a very experience world traveler as you can tell by all my reviews and badges. Whomever the people are that have given this hotel high marks have no credibility. After check in, I went to my room. The door would not open. I had to use my shoulder to bang the door open. The door would also not close without forcing it closed. I was later told that when the temperature is warm, the doors expand and are hard to open. Guess what? This leads to lots of slamming doors all around in other rooms. The biggest problem was that the air conditioning did not work in my room. I asked the front desk to change my room, but supposedly, none were available. Needless to say, the room was very warm during the night. At least the very nice front desk person (Beth) brought us a box fan to use during the night. Also, kudos to Ben for trying his best to fix the AC. The staff is caring and helpful. However, you can tell that the manager (Mr. Khan) could care less about his customer. Just read his responses to all of the negative reviews on Trip Advisor. They are all the same. Copy and paste. The hotel is old and needs a lot of love. Best Western should be ashamed of the management and the hotel. Thank you for your comments, I am sorry that you were not happy with your stay. We tried our best to make sure your AC and your door got fixed and we did get it fixed with in 30 minutes. I was at the front desk when you called, Ben and I worked on the AC and got it up in 10 minutes. Once the the AC was running for about 30 minutes i had Beth call your room and check to make sure that your AC was working and that Ben had fixed your door and you were super happy and very thankful. We do care about our customers and we didn't stop until you were happy. "Unhappy Experience at This Hotel"
Our family of 6 spend the night of July 2 at this hotel during our 3 week vacation. I had reserved two rooms and requested the lower level because I have a bad knee and bad back. The day prior to arrival (I had booked the rooms weeks in advance) I called the hotel to make sure the rooms were on the lower level and was assured that they were. When we arrived, the rooms were upstairs with no elevator. The desk clerk tried to switch things around so we could get a room downstairs but she was not successful, so I had to climb up to the second level. One of the rooms smelled like smoke (although we had requested non-smoking rooms), the shower head was so loose on the wall that I was afraid to adjust it because I thought it would fall off completely. The plugs in the lamps that you're supposed to use to recharge phones, etc., were completely dead and did not work. The breakfast bar was poor with sausage that was freezer burned and tasted horrible. We would NEVER stay at this hotel again. "Not a 3 star hotel"
This is listed as a 3 star hotel. It's not even close. It is a motel, very old, needs updated in the worst way! I would advise anyone considering this hotel to know that it is not as advertised. Just know what you are getting. Thank you for sharing your invaluable feedback with us. We are sorry to hear that your experience was less than exceptional. We strive to exceed all expectations and pride ourselves on amazing guest service, and great room experience. Thank you for bringing your experience to our attention, and we hope you try us next time your passing by. Best hotel for more than one reason. Not only was the overnight stay a good one, and the staff was excellent. Have a motor home, old, that had dry rot tires -- and this staff let me know another guest told them about this. Thanks for saving my husband and I by telling us the tire slit was there. All four tires were replaced by this saving grace guy. Thanks again. Great place to stay! Stayed for 3 nights; friendly staff, breakfast items ran out and were being replenish but it was very slow. Still an enjoyable experience. Upon check in the front desk person was very helpful. Outward appearance was very good but the stair railing and steps are rusting and unstable. I walk with a cane and walking up stairs is not easy. In comparison to the newer plus BW this site has seen a lot of bikers and in places it shows wear and tear in the community spaces. The rooms were clean and for a biker like myself they were adequate. We booked three nights and froze two nights as there was no heat in our room - by the third night it was warm enough outside finally that our room was about 68 degrees and tolerable. Very disappointed that the attached restaurant is closed - although the website boasts this point - had we known the restaurant was closed we would have chosen elsewhere to stay. Rooms let in a lot of noise, running water, dogs barking all night, people talking. However, the housekeeping staff is phenomenal! Very clean rooms - definitely above expectation! The breakfast room is charming and the food was better than most - very good! But if you're looking for a romantic getaway on a budget, keep looking! And always check reviews! While older, this hotel is just fine. The decor is dated and you dont have all of the latest in fashion, but everything works and is clean. the bed was very comfy and the breakfast was great. I will stay her again. Well-kept hotel and at a great price. Very friendly check-in/out staff. The breakfast room is a bit small and closed promptly at 9:30am. However, the attendant told me to take my time and not feel rushed. She quickly got a couple of things I asked for after they had been put away. I was a late evening walk in. I immediately felt comfortable with the staff and they were great. Got to my room, couldn't be happier. They helped make my trip a little better. You should definitely give this place a try. Thank you so much for the great comments, We are very happy you had a great stay with us. We hope to see you again very soon. "Just like home, sweet home!" My granddaughter and I were on vacation and it was getting late. We spotted a Best Western and stopped. We got the "last" room. My granddaughter loved the swimming pool. Over all, it was a great experience! Popular with motorcycle riders (Sturgis has a motorcycle museum and Hall of Fame), you may hear the roar of bikes firing up early in the morning as riders leave for the day. Right next to the interstate, so rooms on that side get some road noise but it didn't keep me awake at night. Bed was comfortable, room was clean and well-appointed. Indoor pool was a nice size. Free breakfast was adequate. Thank you Maura for the great comments. We are very happy you had a great stay with us. We hope to see you again very soon. "Ok but we're not bikers"
Stayed here to check out the town so we could check it off our bucket list. Rooms were clean but dated. Laundry room is available but limited. Unfortunately the motel is located next to train tracks and the interstate so we got to hear both. The restaurant located next to the motel was closed but the complimentary breakfast was decent and the staff friendly. Nice rooms for the price. Convenient to all points of interest. Breakfast was great. Service was wonderful. Staff was helpful and sympathetic as we were there to intern my parents in the national cemetery. I am biker it a place stay there if your only there to sleep and shower. Bar restaurant close looks like it only used during rally. round down. parking lot has round down look. Very disappointed stayed at many best westerns before. normally clean and good value. Skip this one. If you're just looking for someplace to sleep this hotel isn't bad. The bath tub didn't drain. The room we stayed in was dated, but they are renovating. The complimentary breakfast offered a good selection. Conveniently located off of the freeway. Front desk staff were very helpful! "Lovely Staff and Nice Stay"
We checked into the hotel pretty late. We were on a 9-day road trip and this was a stop that was a little further than we had anticipated. We were super tired and ready for bed. The gentleman who was working that night checked us in quickly and was even more than happy to get us extra towels and coffee so late at night. (We didn't want to have to get it in the morning.) Finding breakfast was a little awkward being that it is in a small room off the pool area but the strawberry waffle mix made my morning! We had a great start to the next leg of our trip. "Best run BW in a 9,000 journey across the USA"
I try to stay at a BW when not camping on motorcycle trips as BW usually has breakfast, clean and comfortable rooms, as well as guest laundry rooms. I have stayed at the Sturgis BW in the past and will in the future. Out of all the BW hotels on this trip the Sturgis BW is the best ran BW I have stayed at. The staff at Sturgis were the only staff that were well versed in the BW "Rewards" program as well as the "elite client" program. 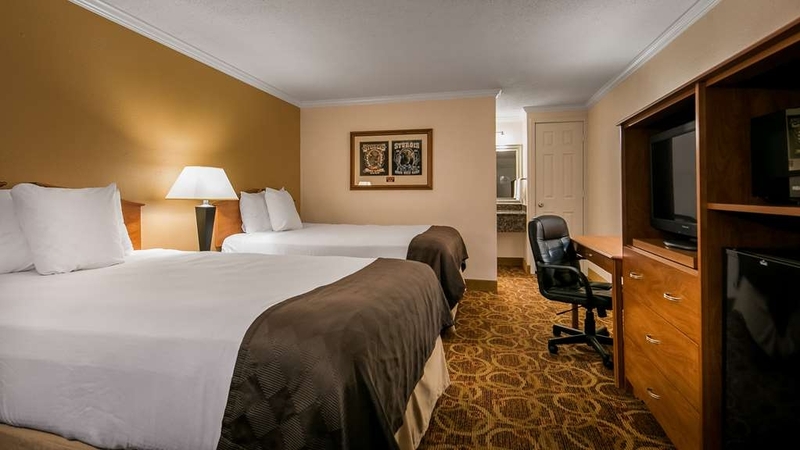 The room was clean and comfortable, the breakfast was great, and the business center had everything I needed. Clearly managment spends time with staff reinforcing a need for customers have a positive experience. Well done, definitely will stay again. Thank you so much Gustavo for such great comments on property!! We are very happy you had great stay with us. We hope to see you again very soon. "Overnight stay with our Dog on our way to ND from NE"
The manager and help there were very nice. The rooms were really clean and quiet. We really enjoyed it. They had a good pet spot for our dog. In the morning we were to early for breakfast but when we went in to check out they had to go bags with fruit, water and a granola bar which was great. I would highly recommend this motel. I would/will stay there again. Great Place! Thank so much for the great comments.We are very happy you had a great stay with us. We hope to see you again very soon. "Older motel, but clean and comfortable"
Clean room, note from maid to enjoy our stay. No problem with reservation, room ready upon a early arrival. AC went out, but manager had it fixed within a 1/2 hour, after calling get an off-duty maintenance man to repair it. Breakfast was good, small area, but service person there was extremely helpful, keeping area clean and stocked up. Would stay there again. Thank you so much for the great comments, We are very happy you enjoyed your stay with us. We hope to see you again when you are passing by. The check in was polite, efficient, and courteous. The cleaning staff had the motel clean for the business customers. James and Miranda serve excellent breakfasts The grounds and exterior appearance were excellent. Welcome back Gary! Thank you for the great comments. We are very happy you had a great stay with us. See you in a couple of weeks. Good for what we needed. Needed to be able to stay close enough to Mount Rushmore and other attractions, and close to the freeway to continue our trip. Easy to travel with our dogs.. small dog area out back by the train tracks..
We nicknamed this hotel, the whistling hotel as the hot tub whistles so loud you cannot relax. Our room also the fauct and toilet of what sounded like the neighboring room whistled even 15 to 20 minuties, so do not expect to sleep. Do not expect cleanliness as does not look like rooms are inspected. Hair, hair and hair left on bathroom floor, tile, bath tub. Shower fauct- disguiting!, room was dusty. The list goes on. Pictures crooked, couple of outlets/lights not work. Could not get an internet connection. Fan was left in room with heating on, guess they tried to clean the floor, unplugged it and had front desk pick it up. We are thankful for front desk lady trying to remove hair and get us another room but could not as none on bottom floor. Also, she did a great job recommending a restaurant. The breakfast lady also very friendly and did an excellent job keeping everything stocked. When she left even asked everyone if she could get anything for them. This hotel needs more staff like these two. I stayed here for work one night. Every employee I talked with was very friendly and courteous. The room was clean and comfortable but dated, and although the door to my room opened to a balcony/hallway the balcony was only accessible to hotel guests. I would recommend getting a second floor room, and not a pool view room as you'll have to deal with the pool smell if your balcony is in the indoor pool area. The gentleman running the breakfast area was very friendly. Maybe I just wasn't hungry, but there wasn't anything that looked terribly great for breakfast. I stayed here because it was one of two hotels in town I could stay in per company policy. Close to the interstate but I did not notice any traffic noise. I would likely not stay here if on my own $. We had a very pleasant stay. The room was clean, but a little old. The front desk clerk told us when we checked in that they were getting ready to remodel and redecorate. It was outdated and a little worn, but it was clean. We enjoyed it anyway. More of a Mom and Pop style Inn. Stay here every year. Just off the interstate. Quiet area. Good rates, comfy rooms. No longer with a restaurant/lounge, but options are close by (JAMBONZ!!!!!) Located on the northern edge of the Black Hills. Close to Fort Meade VA Center, Cavalry Museum, Black Hills National Military Cemetery. Deadwood is only 12 miles. The Bikers Mecca. The hotel was clean great staff. Pool was fabulous it was great for my son he had a blast. Close to all the attractions. Very peaceful it helped make our first hunting trip together a unforgettable time. Thank you so much Richard we are very happy you had an awesome stay with us. We hope to see you again very soon. 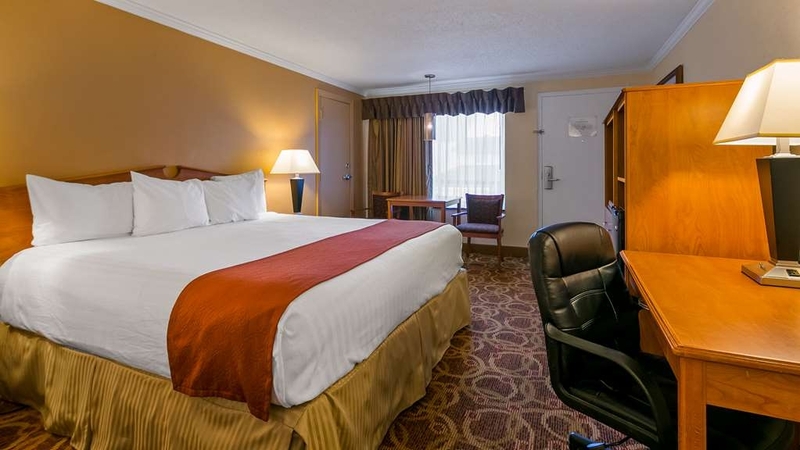 "Professional + Helpful Staff - Location is convenient to highway"
I checked into the Best Western and was immediately welcomed by 3 professional, polite and energetic staff. They were helpful, providing me with information about Sturgis and the surrounding area. The room I had was spacious and very clean. The internet was amazing, by far the best connection that I have had at a hotel in years. I had the breakfast in the morning before I hit the road and it was wonderful. The staff member who looked after the breakfast greeted me with a smile and I had fresh coffee, eggs, toast, sausages and a yogurt. I left with a smile on my face! Great price. Great service. I recommend the Best Western Sturgis Inn. We reserved a room here the night before we were planning to stay here traveling across country. The next day upon realizing we weren't going to make it there we called to cancel our reservation, and we were told that we would still be charged for the room due to their "72 hour cancellation policy". We didn't even reserve the room 72 hours in advance! We tried to explain this to the lady on the phone, who told us she was the "manager", and she was so incredibly rude and told us we were lucky, because she was only going to charge us for one night instead of 3. We have always been Best Western customers and now we will never be again. Be careful reserving this hotel in the "off-season" because they are so strapped for money they will charge you for anything they can! I just love the Sturgis Best Western Inn.It is a great location with beautiful comfortable rooms.There is a wonderful pool area with a Jacuzzi.They have a great breakfast with a great cook who is a pleasure to talk with.The establishment is ran by a great guy who is very fair and accommodating. The staff is awesome! I stay there anywhere between 2-6 times a year while traveling back and forth across country as a Yellowstone Park Ranger.I would highly recommend staying there to any traveler anytime of the year. I go out of my way to get to Sturgis just so I can stay there. Thank you Brian for the great comments, We are very happy you had a great stay with us. We hope to see you again in couple of weeks. Staff was great, very helpful. close to the I 90, bed was comfortable and room was clean. Breakfast was very good and with plenty of variety to choose from. great restaurant couple blocks away. I would recommend to anyone. This location was not like any Best Western I have stayed in and needs renovation. The rooms were outdated and not very warm even after turning up the heat. The breakfast was not what I expected from a Best Western. Had a great stay in one of the newly renovated rooms. All of the staff were very friendly and helpful. The hotel has a great pool area and excellent hot breakfast. Although I was slightly disappointed that the restaurant was closed, I was happy to find that an even better restaurant delivers right to the hotel! I will definitely be staying again. Was giving an upgrade ro suite cuz I am a gold member. When we got to the room is was as if the room was in the middle of a remodel and thrown together last minute. The frig was full of mold, the vent for the ac/heater was full of sheet rock pieces ans dust, there was a heat lamp in the kitchen area?, and many other things. Don't stay here unless your desperate! Thank you for sharing your invaluable feedback with us. We are sorry to hear that your experience was less than exceptional. We strive to exceed all expectations and pride ourselves on amazing guest service, and great room experience. Housekeeping and Maintenance have went through and deep cleaned the room. Thank you for bringing your experience to our attention, and we hope you try us next time your passing by. The breakfast was better than most motel breakfasts, with lots of choices--waffles, eggs, juice, decaf or regular coffee, dry cereal or instant oatmeal, fruit, yogurt, and much more. The waiter was friendly and helpful and checked on things often. The room was clean and comfortable, with a good bed. There was plenty of parking. We didn't use the pool this time, but it is large. Our "senior" room was very reasonable. We will be back. We always stay at this hotel on our way to visit our Montana friends. It is consistent for it's cleanliness and comfort. The breakfast was slightly disappointing though. Eggs were fully cooked but sausage was still cold. Overall, we will continue to stay at this hotel in the future. "Great place to stay near tourist attractions"
"Best value and comfortable room"
Very happy with our stay. Will stay there again on our way through. Price was reasonable for the area close to Mount Rushmore, Deadwood, Custer State Park and other tourist attractions. Room was clean. Our bed was very comfortable and we had a good nights rest. Check-in person kept a nice smile even though several people were waiting to check in. Breakfast was very good and everything was kept full. Went on a bike trip with my little brother and stayed one night at the Best Western Inn in Sturgis because we had a $50 discount from previous stay promotion. Not a place I would go with my wife but good enough to bring my bro :-) The room was clean but old and very well used. Breakfast was very good and so was the selection. The staff and general service was very good. Even though located just beside the highway is was very quiet. Also felt safe! Jim, who works nights and takes care of the breakfast room, does a terrific job. Thank you Jim. Rooms are clean and the pool is well maintained. Location is good with an excellent Jamaican restaurant very close. Thank you so much for the great rating and comments. We are very happy you had a great stay with us. We hope to see you again very soon. Decided to check out Sturgis while things were calm and free of tourists. Found a great place to spend the evening plus some great soul food at Jambonz....recommended by the staff. Great night of sleep....touched off with a wonderful breakfast. Passing that way? Check it out....a good value. Thank you so much for the great comments. We are very happy you had a great stay with us. We hope to see you again very soon. This facility is a diamond in the ruff. Yes, it's older but has been kept up. It has an indoor pool. The grounds were clean too. Laundry room was busy however both washer and dryer worked very well. What makes this place is the front office staff! The gal working when we were the always had a smile, knows her city, and gave honest feedback. She can deal with the check in/out rush with grace and that bright, inviting smile! This is definitely on our list of places to stay again. Thank you so much Vicky for your great comment, We are very happy you enjoyed your your stay with us. We hope to see you again very soon. Very bad water pressure, water was either hot or cold depending on the person's use in the next room. Also towels were really thin and threadbare. The room was either hot or cold you could not get it to the right temp. The breakfast was good and the pool was fine. "4-stars? Not really, but still a decent stay"
When I booked this hotel, it was listed (I don't recall which site) as 4 stars. Really? Don't get me wrong - the room was clean, comfortable, reasonably priced, and quiet even though it was right by the highway. This is kind of a classic 50's/60's layout with all the rooms opening outdoors. No complaints, it met my needs just fine. Just didn't strike me to be on the same level as other "4-star" places I've been. The staff was friendly and courteous. The room was clean. The breakfast was the usual continental breakfast. The beds were comfortable. It was close to downtown activities. Internet was great and the pool was clean. Thank you so much Suzanne for the great comment, We are very happy you had a great stay with us. We hope to see you again very soon. "Clean but old & needs updating"
We stayed over-night and found our room very clean but it was old, small & in need of updating. The beds were not comfortable - definitely needs new mattresses. Both beds in the room had depressions in them due to age. The staff was very friendly. The breakfast was the typical free breakfast offered by most hotels - but I did enjoy the banana bread which was a nice surprise. If you stay here - be careful of the hat water .... It is scalding hot!!! The one positive thing about this property are the people who work there. Friendly and helpful. Other than that, this is an old property that definitely needs improvement. Although the lobby and business center are very nice, I can't say the same for the rest of the place. The outside of the hotel needs some "help". the rooms look dingy and old. Our room had a hot tub in the living room...odd. The hotel is located right off the interstate which is great when you want to get on the road, However, did not like the surrounding area at all. Would not stay here again!!! Do hear the noise from the interstate. "BEST HOTEL EVER! ABOVE AND BEYOND SERVICE!" Kahn and Jim both took real good care of us. We have been to many hotels in and around sturgis, this is by far the best. Not only did the staff meeting our requests but they anticipated and excited them. If I could rate higher I would. We will be customers for years to come. Thank you so much Jordyn for the great comments. You guys were great. Your reservations are all set for next year. See you next Mustang Rally. I had to spend the night in Sturgis on my way to Washington. It was me and the cat, and we found the hotel very pleasant and safe. The room was clean, nicely put together and had good internet access. Down the road, there is a restaurant that everyone should try once, Jambonz. Thank you so much Janice for the great comments. We are very happy you had a great stay with us. We hope to see you again very soon. I stay at allot of Hotels, and run into rooms missing things like tissues, towels, etc. But I must say, I've never had that issue with this Hotel. The rooms are always well stocked and very CLEAN. The beds are supper comfortable and there WIFI is supper fast!!. The new breakfast area is one of the best as well. With a host that is supper nice. Worthy of a tip. The front desk staff are very friendly, helpful and now there stuff. I'll always stay hear when I'm in Sturgis. Thank you Michael for stay with us again. We are very happy you had great stay with us. See you again in a couple of weeks. We stayed here for 3 nights. The service was outstanding and the people were very friendly and willing to help in any way possible. we told him that it was our anniversary and they were very hospitable. Thank you so much for the great comments, We are very happy you had a great stay with us. We hope to see you guys again very soon. Clean, nice sized room, but needs some updating. Friendly, helpful staff. Good location. Good value for your money. More than adequate breakfast. Only down side is the flies in the room, pool area and breakfast room, but in all fairness it is right after the motorcycle rally and all the restaurants we ate at had flies as well. A fly swatter from the front desk solved the fly problem in this room. Thank so you much for the great comments and for stay with us. Have a safe drive back to Canada and we hope to see you again. Thank you so much Deal for the great comments, We are very happy you had a great stay with us. We hope to see you again next year. We enjoyed staying here it was far enough away from the rally to enjoy quietness and yet close enough to go and enjoy it. The breakfast was wonderful. The staff was very friendly. Our room was clean and comfortable. Our stay in this hotel was very enjoyable. The staff was fun and yet very professional and helpful. This is one of the greatest Best Westerns we have stayed in. We will definitely return when we are in the area. Thank you so much Steven for the great comments. We are very happy you had a great stay with us. We hope to see you again very soon. I stayed in the suite on bottom floor, desk help was very professional and helpful on local information, room with jacuzzi very roomy and clean. Location in walking distance to downtown activities and good restaurant s. If your a walker . They have parking spots available, to back in motorcycle trailers. Pricing under $200.00 which I consider good, rally's kicking off. Stayed for a night on a 10 vacation and I wish all of our other hotels were as great as this one! Super friendly staff, very clean rooms, and overall I wouldn't change one thing about our stay! I'll be booking a room here again the next time I'm through! Thank you so much Neal for the great comments about your stay with us. We are very happy you had a great stay with us. We hope to see you again very soon. Room not ready until 70 min after check in, carpet sticky, bathtub discolored, clerk snotty. The restaurant was closed. I asked for a better rate since we were tired and had planned to check in at check in time, but was told "things happen." The tub was so old school the enamel was worn off. All in all a good stay. The staff was friendly and helpful as we were somewhat stranded with a disabled motorcycle. The motel was clean with a typical Best Western breakfast and amenities. The staff was helpful in advising us where to go for a good dinner, and sites to see. Thank you so much Lee for the great comments. We hope to see you again very soon. Room was spacious, clean. Staff very friendly and helpful. Restaraunt was closed, but we were directed to a great dinner just down the road. As far as the free breakfast goes, it was good. Only down fall was location, right off the highway, a little highway noise. Thank you so much for the great comments Daniel. We hope to see you again very soon. Most hotels in the BW family are suffering from decades of neglect. Not in Sturgis. They have re-faced the entire facility, provide a terrific breakfast overseen by a very cheery Jim, have an indoor pool and hot tub, and a front desk staff that will do anything to improve a traveler's visit. Sure, the room interiors need upgrading (they know it, and they are planning for it), but they have already installed upgraded heat/AC units that are quieter and controlled by an actual thermostat. They still have a ways to go to catch up with the Holiday Inn Express, but at least their prices recognize the disparity. Kudos to this Best Western. Thank you so much James for the great comments. Come back and see us again. We stayed at the Best Western in Sturgis for three nights. We were a little disappointed in the quality of the accommodation for the price we paid but we were fairly satisfied when all was said and done. We had a two room suite. The room was tired and old and really could use some updating. First impressions were not very good, although the room was clean. We walked down an interior hallway to find the location of the breakfast room. That hallway was littered with small pieces of garbage. It was not a good first impression, although the next morning as we went to breakfast, I noticed that it had been cleaned overnight. The breakfast was good with many choices. I felt the price was a bit high for the condition of the room but the service and cleanliness were good. The woman at the front desk was very pleasant but the property was not clean. They had carpet around the pool that was disgusting. The room was clean but the sheets looked like someone walked on them. Dirt marks. Thank you Beth for your review, I am very sorry that your stay was not to your satisfaction, I have talked with our staff to make sure this dose not happen again. Thank you again and we hope you try us again. We recently made our first Motorcycle tri to Sturgis and had to find a Best Western Hotel because thats where we stay. We were not disappointed with Best Western Sturgis Inn, reception was very polite and helpful we were informed that there was a hose and pail with cloths to wash down our motorcycles if we needed. The room and service was excellent. The complimentry breakfast was excellent with an awesome attendent who made sure we had what we needed. Recommend this hotel to all many thanks. Thank you so much for your great comments, We are very happy you had a great stay with us. We hope to see you again very soon. We booked this hotel on a family road trip through the west. We used the Trip Advisor app to find the best hotel on our route, and we got it. The lady at check in was super friendly, the room was nice, the beds were comfortable, and the breakfast was great. We will definitely stay here again if we are in the area. 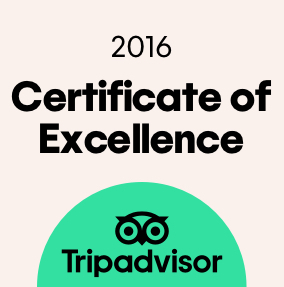 Thank you to the staff, and thanks to our fellow reviewers for a good experience. Thank you so much for your great comments we are very happy you had a great stay with us. We hope to see you again very soon. We had two rooms here. Everything is pretty standard for a chain hotel. The thing that separates this particular hotel was to staff. I had interactions with Jim every morning at breakfast. All you had to do was ask and he was more than happy to help. At check out I met beth who offered a very pleasant conversation. The staff give this hotel a 5 out of 5. I don't need luxury. The pool was a nice bonus. Thank you very much Robert our staff is very happy about the great comments. We hope to see you again very soon. overall a good hotel. I thought a bit pricey for the small town location, from some of the other Best Westerns. Did like the room with the balcony and a few chairs to sit outside the room and relax a bit. I thought the whirlpool and pool were nice and temp. was good on both. Thank you so much Kevin for your great comments we are very happy you had a great stay with us. We hope to see you again very soon. "Overpriced, noisy and worn down room"
Really disappointed in my room (esp for the price paid) - VERY loud; unfortunately I had a room with outside access (facing the parking lot) and was kept up all night with people loudly chatting and coming in and our of the hotel. I imagine an indoor access room would (hopefully) be quieter. Rate was VERY high for the value, but to be expected in a tourist town, I suppose. I asked to change rooms, but unfortunately there were none available. Room was dark, smelled of cigarettes, and the floor had several damp spots. Pros: bed was comfy, breakfast was typical BW affair (lots of options and hot options were hot and fresh) and every staff member I encountered was friendly and accommodating when able. I think this hotel is just older, a little run down, and the price is driven high by tourism. I wouldn't stay here again, though, even if offered an indoor access room; isn't worth the risk of a another bad night of sleep. The room was clean and the pool and spa area was large. The breakfast was hot and ready to go. Over all it was a good experience. The parking lot was adequate for all the cars. Internet access was easy and reliable. we stayed at this Best western and it will not be on my list of my favorite hotels. Although the staff was super friendly the rooms were disappointing. The cleanliness was way below what it should be. While taking a shower, the water would go from scalding hot, to freezing cold. I would not recommend any child to take a shower there. We left for our meeting Friday morning and go back around 7 pm. As we drove up. we noticed our room door was not shut - the cleaning person did not shut the door to our room. We are very lucky nobody went in and took our belongings! Overly kind staff from check in to check out! Even the man in the breakfast area was eager to take trash, refill coffee and breakfast items. He was a super nice guy, and he was all smiles. The rooms are divided. Some have inside entrances and some have outside entrances. Ours was an outside entrance on the second floor. It was clean with a comfortable bed. It's an older hotel in an older town, but it's very clean and I would gladly stay again. Thank you very much Kevin for your great comments on our staff, We are very happy you had a great stay with us, and we hope to see you again very soon. Old hotel with only double beds and microscopic bathroom ( you can't use the toilet and open the door at the same time). No air conditioning, only an old chiller system, so you are sweating after getting out of the shower. Breakfast was average, but laid out in a bottleneck, (plates here, utensils over there, coffee right in the middle of everything). Not what you would expect from the Best Western franchise. Thank you for your review, I am very sorry that you were not satisfied with your stay, We do have rooms with Queen beds and King beds as well as double beds, When you checked in late that all the we had left for the night as it was a busy weekend. As for the A/C in your room it has been checked by our maintenance and it is working great. Thank you again for your review and we hope you try us again. Thank you very much Dan for the great comments about your stay with us. We hope to see you again very soon. This is the worst experience I have ever had at Best Western we always try to stay at Best Western. The clerk that evening was rude and told my husband he could just look at the hot tub. Then the mix up on the room and giving us double bed then had to move upstairs the odor also I would not ever recommend this place to anyone. Great location, friendly staff and a nice clean room! We spent two nights here while on vacation. It was located close to the sights we wanted to see. We asked for a restaurant recommendation and were directed to a nice one. Gas station was next door. We will definetly stay again. I have stayed at the Best Western Sturgis Inn motel because the rooms are clean, the staff is courteous, motel rooms and the surrounding grounds are clean. The ownership is planting flowers and trees. The swimming pool area is clean. The ownership is in the process of repainting and doing any outside repairs that are necessary. The ownership also keeps the rooms properly maintained. They have an excellent maid service for the maintaining of the rooms. I have said everything I want to say and it's less than 200 characters. We were in the pet section, the room was a little small and dated but ok for a quick stay on our way to the Black Hills. We were lucky to get a room; it was full. The breakfast that older reviews mention is no longer available. The restaurant owner retired; now they only offer a continental breakfast that is not special. We were disappointed as that was one reason we decided to book a room here. If we had it to do over, we would have stayed in Spearfish, and not had to backtrack to drive to Deadwood on the beautiful Spearfish Canyon byway. Not allowed to use awning area to park motorcycles even in severe weather. I was not told about this hotel parking policy until after checkin. I have stayed at Best Western hotels many and have always parked my bike under there awning. Sturgis of all places. My husband and I are traveling. We stopped in Sturgis, S Dakota because my husband rides. This hotel was great. We got a suite instead of a room and that was a surprise considering the cost. Clean with very comfortable bed and furniture, indoor jacuzzi and pool. Breakfast was free and good. Service was great. Highly recommend. Although the hotel is very close to the inter state and our room was facing the highway the room was very quiet. The building is showing it's age the staff was very helpful. The bed was comfortable and the morning breakfast was better than the average BW offering. awesome service clean rooms good location . I would stay here again overall great experience. Nice and quiet , rooms were very clean the staff was awesome and very satisifed would stay here again. I will recommend this to friends and family. The staff were alright but the night shift didn't know were to get us some more coffee for our room. The pool was uncovered our first night and then covered up the next night. Coud not understand why we had to be all the way around at the back of hotel when there were not very many people at the hotel during our stay. "The best place to stay in Sturgis"
We stayed in the King bed suite - nice large room, very comfortable, and very reasonably priced. What set this place heads and shoulders above other hotels we have stayed at is the people. Everyone was delightful! I couldn't pass someone without them sincerely asking if they could help me, or asking how I was doing. Everyone had a smile, and a cheerful word. It made a strong impression on me. Thank you very much for the great review about your stay with us, We are very happy you had a great stay with us. We hope to see you again very soon. "Nice hotel with wonderful staff"
Sturgis is not known for it's great hotels, but this was the best! Good value for the price. Comfortable and good location. What sets this place apart is the wonderful people they have working there! Not once did someone pass me and not ask how I was doing, or if there was anything they could do to help me. And they seemed sincere in their efforts to make it a pleasant stay. Would recommend them again without reservation. Clean, well-appointed, nice set up for pets, friendly staff. Enjoyed our stay. Stayed overnight on our way to Yellowstone. Rooms for pets were in back next to train track but never heard train. Had designated pet area right there next to track. Indoor pool. Thank you very much Gerald for the great comment, We are very happy that you had a great stay with us. We hope to see you again very soon. Stayed one night in late April. Room was reasonably priced . Had a room on the ground floor with a direct to outside room entrance. room appeared clean and was appointed well but was a tad bit dated. Looked as though some updating is taking place. Beds were comfortable . Continental breakfast was decent with the usual fare and the staff was friendly and helpful. Thank you very much Terri for staying with us and for the great comments. We hope to see you again very soon. "a 33-year tradition just got better"
Have been staying at Inn for 3 decades-plus every spring turkey hunting season. The new owner continues to be perfectly accommodating to our group's late check-in, early check-out (sometimes we get our turkeys the first day), as well as delaying our departure a few hours beyond 11 AM to allow for a last minute gobbler to come to our call or wait for a blizzard to end so that we could stay on. 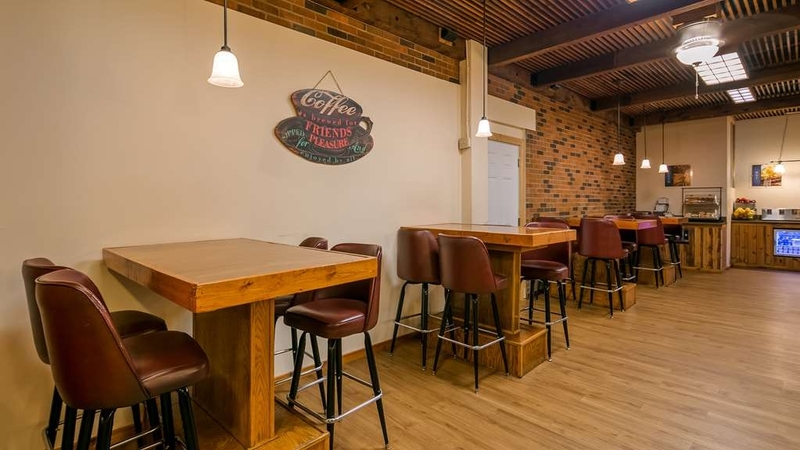 The new, comfortable beds and bathroom fixtures, brand-new, fresh, extremely clean continental breakfast area with comfortable seating and good, fresh food-all of these make the Inn even nicer. Owner was present on site, very kind and friendly can't beat that. Needless to say, we'll go back next year-but at our ages, another 33 years? Extras-nice full restaurant part of building and a convenience/gas store next door for the early morning coffee, muffins and everything a turkey hunter needs at 4 AM. Thank you very much for the great comments, You guys were great to talk to, I hope you have better luck getting some turkeys next year. See you then. "Not what Inexpected from a Best Western property"
Thank you very much for staying with us, I am very sorry that you were not satisfied with your stay. We try very hard to make sure every guest has a great stay with us. The breakfast we offer is approved Best Western breakfast, We offer variety of items like Waffles with 6 different toppings , We also have 3 different types of yogurt that comes with 6 different types of toppings to put on, We have Toast, Variety of Muffins,English muffins,cinnamon rolls, hard boiled eggs,oatmeal with 6 different variety of toppings , and 3 different types of cereal. We do allow pets, and we do have pet friendly rooms. When checking in we do ask our customers if they are traveling with pet so we can accommodate them with pet friendly rooms. The room is clean and nice. Its average in decor and dated in appearance. I thought it was an excellent night of sleep and included a great breakfast next door to the hotel. The pool was closed, so I did not get to enjoy that. I forgot my collar stays for a dress shirt and the front desk staff kindly gave me some paperclips. Really saved my keister! "Great Place for our Family get together!" Each year my family comes together from different parts of the country to meet in Sturgis because it is somewhat centrally located. 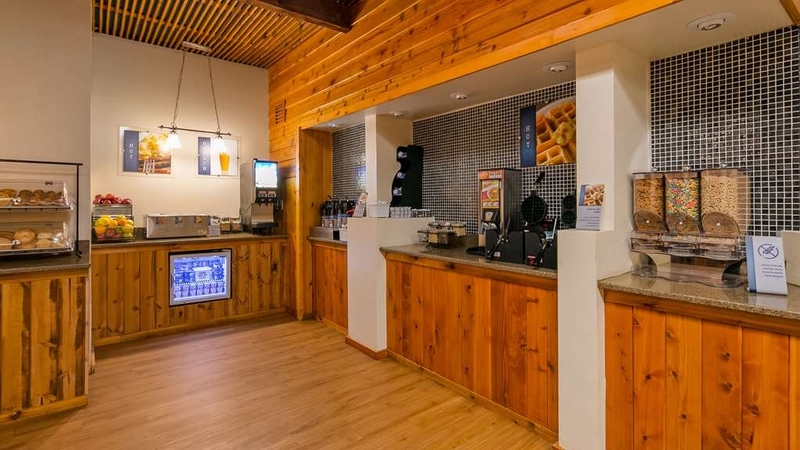 We have been coming to the Best Western Sturgis Inn now yearly for 5 or 6 years and are continually impressed with their hospitality, cleanliness and good value that it provides. 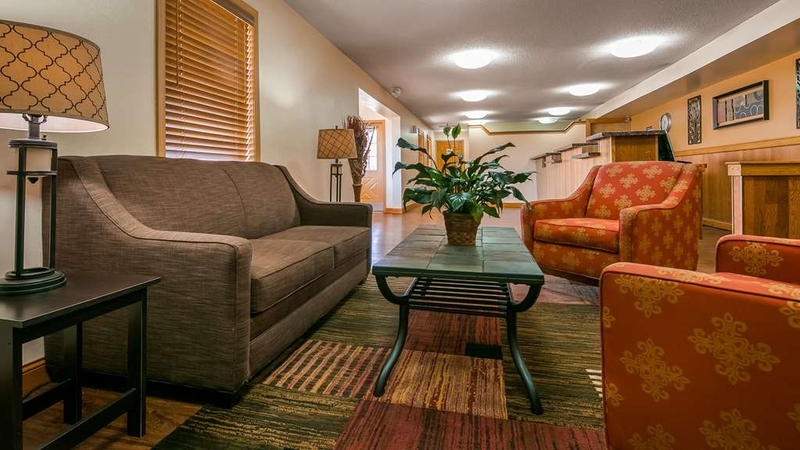 We have 17 people in our group that varies in age from 4 to 60 and between the pool, great common area, made to order breakfast, and proximity to other activities around the Black Hills we can truly enjoy our family time together. I highly recommend it for a one night stop or a family function such as ours. Thank you very much Wagner for the great comments, We are very happy to know that you guys enjoyed your stay with us again. We cant wait to have your family back. See you next year. We stayed only for 1 night but were very pleased with the accommodations. The room was very comfortable and we did not hear any highway noise even though we were right next to it. The hotel staff was so friendly and helpful at all times. Definitely worth checking out if you need a room. We would certainly go back to this location again! Thank you very much for the great comments on the Best Western Sturgis Inn, We are very happy you had a great stay with us. We hope to see you again very soon. My wife, son and I went to Sturgis SD March 20-24 to visit family. We had an excellent stay at the Best Western in Sturgis. The hotel is very nice and clean, at a good location in town. It is near the interstate, however we did not hear any traffic. The staff was very friendly and accomadating. They also include a complimentary breakfast at Caddy's, the restaurant attached to the inn. This isn't the usual free hotel buffet, but a full choice from the breakfast menu. Definitely recommend staying here. Thank You very much Scott for the great review, We are very happy you had great stay with us. We hope to see you again very soon. Thank you so much for great review Allison, We are very happy you had a great stay with us. We hope to see you again very soon. "This is the friendly Best Western"
Thank you so much for all your help and concerns during our stay. From the minute we checked in we were given EXCELLENT service . The restaurant was clean and all food was very appetizing. The cook and waitress were a hoot. Will be back for other business! Thank you very much Kris for the great comment on our staff and on your stay. We are very happy you had a great stay with us. We hope to see you again very soon. "My faverate stay in Sturgis"
Stayed here again and I must say, They're constantly upgrading. Nice lounge to sit in and visit with a neat new fire place. Beds are always comfortable. Hospitality is always the best. And yes, the breakfast is a great start to my day. Close to the Hwy, But not noisy at all. And for those whom have pets, a good size roaming area for the sniffers. My place to stay while in Sturgis. Thank you again Michael for the great review, it is always good to have you here staying with us again and again. We are very happy you had another great stay with us. See you in a couple of weeks. Most friendly helpful check in I ever experienced. Was in a bad storm and very tired. Did not know the area and needed rest and a hot meal. Called and was very impressed by the friendly helpful lady on the phone who after a brief description of my surroundings guided me in to their location. Then had a smooth check in. I'll make a point of staying here again when in the area. And check out was just as nice. He made coffee for me even though it was quite early to get back on the road again. Thank you Chuck for the great review, I am very happy you were very impressed with our staff, we try very hard to do anything we can for our customers to make their stay great from check in to check out. We hope to see you again very soon Chuck. A nice hotel very good and polite desk clerks and housekeeping helped me with a lot of things I would rate it as a five star motel even though it,s in a small town and the rooms are kept up very well. Thank you for staying with us Mike and for the great review. We are very happy you had a great stay with us, We hope to see you again very soon. Let's get this out of the way: this place has recently been updated and that will definitely deceive you. three of us had our own room for a night and we all agree this place has a common room problem: the old breaking down radiators to heat the rooms. that's right a boiler system sends hot water through the rooms to the radiators. there'd be nothing wrong with this however the radiators are so noisy it sounds like water is continuously running through the walls. horrible place to choose if you're looking for a good night rest. and if you have an outdoor room you're going to hear the lovely traffic blaring down the highway since the windows and doors have a horrible sound barrier. the recent update to this place is a huge deception. I stayed at a different hotel that also operated with these type of radiators and they were quiet. oh yeah and the mold next to the radiator. I took a picture so you could see it. in a nutshell this place is horrible. Thank you for your review, on three separate occasions, There were 6 different rooms that you looked at during you two night stay with us and you didn't want to move out of that room, because the other rooms were either upstairs or outside or in the pool area. During this time we were not aware of the problem that you mentioned in this review, if we would have been notified of the issue we would have fixed it immediately.We tried to make your stay with us as comfortable as possible by showing all these different rooms and apparently you were still not satisfied. Again thank you for the review. We visit Sturgis every year to visit family. This was our first time staying at The best western as our "normal" hotel we normally stay in was completely booked very far in advance due to the rally. We were extremely satisfied with our stay. Our room was clean, the beds were comfortable. We had a pool side room and the kids loved it. The pool was warm, which is a must for us. The staff were very pleasant and helpful. The best thing is the free breakfast that you receive at the restaurant. It is delicious! And the waitresses do such a good job, also make sure you still tip them appropriately. We noticed several hotel goers were not tipping as their breakfast was free. That's unacceptable, please tip your waiter/waitress appropriately. They were all working very hard and went above and beyond for their customers. The hotel itself could use some upgrades as it is dated, however, it was clean and well kept. We will be staying at this location again, the price combined with location, and again the awesome restaurant were enough to make us say goodbye to our "normal" hotel stay. Thank you very much Lyndsay for your great comments about the Best Western Sturgis and the staff, we are very happy you had a great stay with us and making the Best Western Sturgis as your place to stay from now on. WE had a Very nice King Suite... The Rooms are Clean, and The Staff Does a Great Job, Keeping them Clean. I will Bring a Blanket next Time, It was a Little Chilly, But I should have asked the Staff for a Blanket, Next time I will Bring my Own, or ask. Other Wise, Very Good for the Money, and Friendly and Clean!! Thank you Trish for coming back and for the great comments, we are very happy you had a great stay with us again. We hope to see you again very soon. "Pleasure trip to family for Christmas"
After a long day of driving, we were promptly greeted by staff. The dry humor of Manager Basit Khan made us laugh as we checked in. On our return stay a week later, he again showed his fun sense of humor while registering us and finding us a room with our requests. We also appreciated the adjoining restaurant so we did not have to drive in the frigid temperatures for our evening meal. Thank you Michael for such great comments, It was great having you guys here. We are very happy you had a great stay with us, we hope to see you again very soon. We have stayed at a number of Best Westerns this past year. This location was by far the best. Nice location to town and highway. Very clean, quite room. We were upgraded to a suite which made our stay even more special. Thank you James for the the great comment, we are very happy you had a great stay with us. We hope to see you again very soon. We got stuck in the snow that hit week after Thanksgiving. Staff and workers at restaurant very helpful with road and weather reports. This hotel was very reasonably priced, very clean and comfortable. I would recommend. Thank you very much for your great comments, we are very happy that you had a great stay with us, we hope to see you again when the weather is nice. Friendly people. The place is a little out dated but the rooms were clean and the bed comfortable. They give you complimentary breakfast at the restaurant next door. It's close to the Blackhills and downtown Sturgis. Thank you Cathy for your comment, we are very happy you had a nice stay with us. We hope to see you again soon. Great value and Great customer service. The rooms were clean and appreciated that. Had a good swimming area and the food at the restaurant was great. The house cleaning staff did a good job and were very helpful. Would diffidently stay at this motel again. love the area of South Dakota as well. Thank you very much for your comments, we are very happy you had a great stay with us. We hope to see you again very soon. I love returning to this Hotel. As always the customer service is great. This time, while making my reservation, the desk clerk recognized my relationship with Best Western and advised me of my bonus points I earned with this stay. Wow, who knew. The beds are supper comfortable, and as always, a couple bottles of water waiting in the room. And even upgraded the WiFi. Super fast. Free deluxe breakfast, cooked to order. Quiet, peaceful, Very relaxing. And always supper helpful and enjoyable. To bad my little buddy's not with me, he always enjoyed saying high and playing with the other dogs staying hear. Great place to stay while in Sturgis. Thank you very much for the great review and coming back and staying with us again Michael, We are very happy you had a great stay with us, see you in couple weeks. I was extremely tired or I would have moved on to another choice. The room was very oddly furnished with cheap items that had super high miles on them. The room reeked of cigarette smoke even though it was a no smoking room. Bed was comfy and the breakfast next door at Caddys was a plus. We enjoyed our stay at this hotel. The room was very clean, and comfortable bed, Wi Fi connection was fast and good. Food at the attached restaurant was really good and it was easy to get to from the hotel.. The hotel check in person gave us tips to see in the town and also gave good directions. Thank you very much Patricia for your great comments, we are very happy you had a great stay with us and we hope to see you again very soon. We have stayed at this hotel at least 3 times, all during Mustange Week in Sturgis. We reserved our romms ahead of time, and got exactly the ones we wanted, ( we traveled with a group of friends). The staff made sure we were all together with side by side rooms. The staff was very friendly and helpful. We liked the breakfast that was provided at the connected restaurant, we were given tickets at the front desk for this. Our rooms were clean. We felt safe leaving our show cars in the parking lot. Would definately stay here again, and recommend it to all. Thank you for your great comments, we are very happy you had a great stay with us. See you again next Mustang Rally. "Great hotel, great staff, except........"
If you are planning on staying at this hotel.......I highly recommend it. BUT, if you are planning on leaving a grutuity, give it by hand to the housekeeping person that actually cleans your room. DONT, I repeat.......DONT leave a grutuity in the room, the housekeeping person won't get it. The head housekeeping supervisor goes into each vacated room on check out prior to the housekeeping staff and pockets the grutuity. The house keeping staff that cleans your room NEVER receives the gratuity that you left on the table. Maybe it's unwarranted snobbery, but we didn't expect a lot from a Best Western. This place was conveniently located to both I-90 and downtown Sturgis. The room was clean, reasonably attractive, comfortable, quiet, secure and well-maintained. Breakfast was good. Since we used this only as a sleep spot, there isn't much more to say except that I may have to revise my opinion of Best Westerns, and we were pleasantly surprised. Thank you very much for your great comments, we are very happy you enjoyed your stay with us. We hope to see you again very soon. Booked a suite with king sized bed and got two twin beds. Went to the front desk and that was changed. Our room had three different colors of grout (due to stains) in the bathroom and stains on carpets. Ok, I can deal with that. Air conditioning took forever to cool down when it was 50 degrees out. Bed was comfy. The noise however was extremely bad. We could hear every door slam and every footstep of the family above us. Highlights were the pool and hot tub as well as the fantastic breakfast. "This was a great hotel for Sturgis Bike Week"
Sturgis Bike Week is crazy. I chose to hotel it rather than camp and I'm glad that I did. This hotel is well located, clean and safe. "Da Bus" - that famous bike week shuttle service - stops here every hour. Get an interior facing room. The breakfast was great and it was a good way to meet other folks who were in town for Bike Week. Thank you very much Mitch for your great comments, we are very happy you enjoyed your stay with us. We hope to see you again very soon. We had just planned to pass through Sturgis after only an 11 mile drive from Deadwood, but there was a motocross race going on downtown on main street and it was fun, so we stayed the whole day. The hotel was absolutely perfect! We had an inside room by the pool and just across the indoor pool was a door to a bar and restaurant. What more could you ask for after a day at the races! Must admit that some loud kids were playing in and around the pool and that didn't bother me at all, but I could see how some folks might prefer an outside room and they have those too. Breakfast was a voucher for the adjoining restaurant and it was good, proper breakfast, bacon and eggs, hashbrowns and toast. Sturgis was great! Thank you very much for your great comments, we are very happy you had a perfect stay with us. We hope to see you again very soon.